Campaign 2012 - How do we Earn the Youth Vote? Think smaller government! 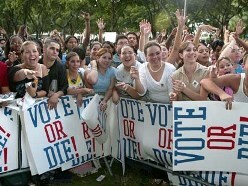 Many think Obama has the youth vote wrapped up. However, this week I received an email from Matthew Faraci with "Generation Opportunity" (GO). GO is a non-profit group that is working on engaging young adults, early career professionals, college students, construction workers, members of the military, veterans, entrepreneurs and young mothers and fathers who find themselves dissatisfied with the status quo and seeking to create a better tomorrow. The following article is written by GO and is reprinted at TexasGOPVote.com in its entirety with the permission of GO. Washington, DC – (8/15/12) – Generation Opportunity, one of the largest groups in America engaging and mobilizing young adults, or Millennials, on the important economic issues facing the nation in 2012 and beyond, unveiled its newest social media platform today. The Facebook page, “We Like Small Government,” fosters debate on the appropriate size and scope of government, the impact high taxes and more regulations have on job creation, and the importance of economic opportunity and individual freedom. The page has already amassed over 400,000 fans and surges Generation Opportunity’s total fan base to well over 4 million young adults. The declining labor participation rate has created an additional 1.715 million young adults that are not counted as "unemployed" by U.S. Department of Labor (BLS) because they are not in the labor force, meaning that those young people have given up looking for work due to the lack of jobs. Only 31% of those 18-29 approve of Obama’s handling of the youth unemployment. 53% believe lowering business taxes increase hiring. 59% believe the economy grows when people are allowed to create business without government interference. · 18% delay getting married. Read about Generation Opportunity here; visit “Being American by GO” on Facebook here, “The Constitution by GO” on Facebook here, “Gas Prices Are Too Damn High” on Facebook here, “Lower Taxes by GO” on Facebook here, “Keep Texas Awesome” on Facebook here, “Jersey Proud” on Facebook here, and “We Like Small Government” on Facebook here. For our Spanish-language page – Generación Oportunidad – click here.